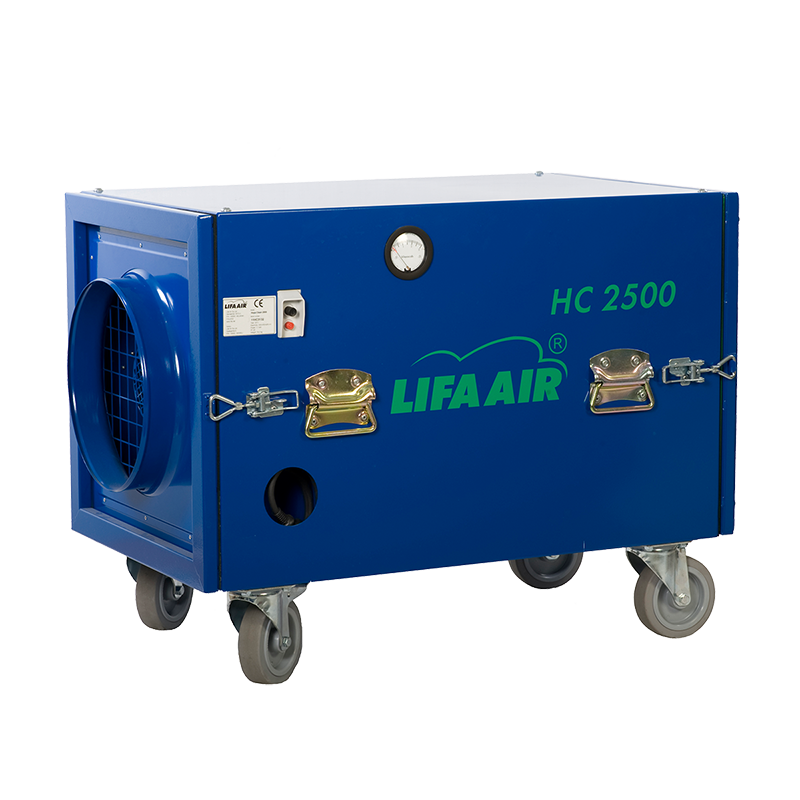 Lifa Air HepaClean 2500 is ideal for removing gaseous compounds. It features an airflow of 2800m3/h. HepaClean 2500 is a multi-function machine intended for cleaning dry air containing asbestos, mold, quartz, powder or wood dust. When the machine is equipped with an active carbon filter, gaseous compounds can be removed. The machine can also be used to create negative pressure in rooms, compartments and ventilation ducts. The sealing and separating level of Lifa HepaClean 2500 has been tested with Lifa filters. The vacuuming unit is very suitable for removing fine dust from the air, which is why it is commonly used in problem dust renovation. The exhaust air does not need to be channeled outside when using a Hepa filter. The Hepa filter has an extremely high separation level, which removes 99.97 % of particles over 0.3 micrometers in size. The machine thus meets the criteria set for machines used in asbestos work. A connection unit for both the suction and exhaust side is available as an accessory. A flexible accordion hose, which can be installed near the demolition site, can be attached to the connection unit of the suction side. The contaminants formed in the demolition work are sucked directly into the machine, before they are spread into the work site air. With the help of the exhaust side connection unit and the plastic film sock, the exhaust air can be channeled outside the work site and thus the work site can be kept at a lower pressure than its environment. Because of the lower pressure, contaminated air is unable to spread outside the work site.